This 2 bedroom villa is the perfect destination for those who want to get away from the hustle and bustle of South Bali, and experience the beauty of a true Balinese seaside fishing village, whilst enjoying the history, culture and warm hospitality. Part of a resort, the villa is a style 1 bedroom and open plan mezzanine bungalow located right on the beach with full ocean view. It is perfect for a family with two children. This 1 bedroom villa is part of a resort of four bedroom villas. The resort is decorated with exquisite teak furniture designed and constructed specifically for each room. This 2 bedroom Villa is part of a Resort of contemporary villa style accommodation. Each villa has it's own private garden stepped into the hillside. 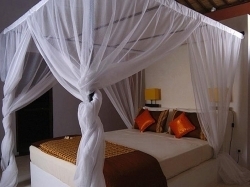 This 1 bedroom Villa is part of a Resort of contemporary villa style accommodation. Each villa has it's own private garden stepped into the hillside. This 3 bedroom deluxe Villa is part of a resort of 14 intimate and luxurious modern Balinese villas, which are set in natural haven and awesome vista of surrounding area. 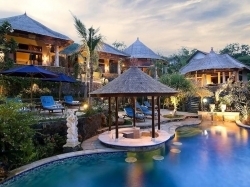 This 2 bedroom Villa is part of a resort of 14 intimate and luxurious modern Balinese villas, which are set in natural haven and awesome vista of surrounding area. This 1 bedroom deluxe Villa is part of a resort of 14 intimate and luxurious modern Balinese villas, which are set in natural haven and awesome vista of surrounding area. This 1 bedroom Villa is part of a resort of 14 intimate and luxurious modern Balinese villas, which are set in natural haven and awesome vista of surrounding area.